Here are four interesting graphics representing different kinds of activity in the United States. The top panel represents population concentrations across the United State. The second image is air traffic across the country, and the third image is internet traffic across the country. The final image is a photograph of the United States from space at night, showing the concentration of lights across the country. 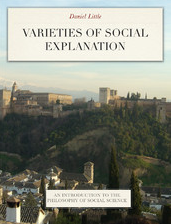 Basically the images correspond to where people live; where they travel; and where they exchange data. Unsurprisingly, the maps line up very well. The most interesting question to consider is not the structure of the networks represented by air travel and internet activity. 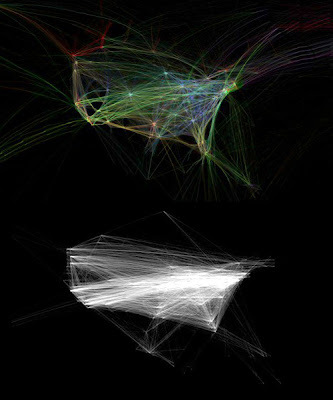 The nodes of both air travel and internet traffic line up exactly with the cities and metropolitan areas represented in the population map, and they align well with the concentration of lighted areas in the bottom frame as well. The patterns of both air travel and internet traffic take the form of a swath extending from the dense eastern corridor of the US (Boston to Washington) to California (San Francisco to San Diego), with Chicago standing out as a significant node in the middle of the country. This is entirely obvious and predictable; travel and communication follow population density. Fundamentally, a city that originates 10 times the volume of internet traffic compared to other cities of similar size is worth looking at in detail. Its activity level suggest an exceptional concentration of organizations and people that are unusually integrated into global networks of communication and data exchange. It is a location for knowledge-intensive activity: high-end services, banking, universities; and it is a place with intensive relations to other nodes. Likewise, a city that originates 5 times as many air-travel passengers as comparably sized cities elsewhere is likely to be a specialized location for business and high-end service activity (or else a population of very dedicated tourists). In other words, the most interesting feature that these data sets might show us about the economic roles of US cities is not visible in the graphics presented here. So it would be very interesting to be able to "divide" the activity levels represented by the middle two graphs by the populations represented by the top graph, so we could see which cities in the US are "super data exchangers" and "super travel generators". And this would give us an indication of the degree of high-end, knowledge-intensive activity that is concentrated in the place -- thereby providing a measure of its importance in the national and global economy. It is possible, for example, that Ann Arbor or Madison would show up as spikes of internet activity relative to their relatively small populations; and Raleigh-Durham might show up as a spike of air travel relative to population, reflecting an unusual concentration of high-end service businesses in this region. The above-average data and air-traffic nodes are perhaps the dynamic centers of 21st-century economic activity. Likewise, it would be interesting to identify the cities that have lower-than-expected levels of travel or internet activity; this would suggest local economies that are somewhat more self-contained and less integrated into the national economy than other locations. And it would be interesting to see if there are significant pairings among locations for either kind of transaction; for example, is the volume of data exchange between Los Angeles and New York significantly greater than that between New York and Chicago or Boston? And would this serve as an indicator of the degree of economic and business integration between these specific locations? These views of the United States are interesting because they allow us to see the country as an inter-connected system of places and activities. They serve as something like a dynamic CT scan of the brain: certain connections between places "light up", providing an indication of systemic activities that warrant further investigation. Since the idea is to look at cities that are more integrated into global networks, the best thing would be to consider cities across the globe. I recently visited Beirut after living in Cairo for some time, and asked myself: How is it that Beirut, with a population of only 1-2 million, seems to be of the most culturally cosmopolitan cities in the world, while Cairo, with a population of perhaps 20 million, seems much less connected to global cultural networks? Eric Huybrechts's chapter on Beirut in Sassen's edited volume Global Networks, Linked Cities doesn't answer this question. I think you'll find this project interesting: 19.20.21.